Hello February! I have no idea what happened to January, but I know I was having fun messing around in the desert and on the beach in my truck with my dogs. I just love Rocky Point and all of the open spaces that you can explore. If you’ve found a cool place drop us a line so I can go check it out! We took a trip out to Playa Mia the other day and the road getting down to the beach was really washed out by all of the storms last year…and it was a blast!! If you love exploring and 4x4ing, there are tons of places to go and have fun while staying off of the city’s beaches and streets. You can find topo maps too of the area, so you stay out of the estuary muck. Okay, on to big news…cruise ship and our new office! No doubt most of you have heard or read about the cruise ship that will depart from our little fishing village on an 11-day journey this December 7th. It’s hit National and local media and on many recent trips to Arizona, everyone wants to talk about it! Which, of course, is fantastic. It will be the maiden voyage of the 250-cabin Astoria and you’ll be visiting Guaymas, Santa Rosalia, Loreto, La Paz, Cabo San Lucas and Topolobampo. The per person price for a twin inner cabin is $1399 USD and $1869 for a twin ocean view. The Astoria is owned by Cruise and Maritime Voyages and you can get all of the details and reservations at www.us.cruiseandmaritime.com/cruise/r004/treasures-of-the-sea-of-cortez. This announcement DOES NOT mean that the Home Port will be completed by the end of the year, that is still awhile out, but it’s a great step in the right direction and we should be seeing some movement soon. And now…drumroll please…The Rocky Point Times is getting a new office!! Yay! No more terrible parking, leaky roofs and fighting holiday traffic, though I will miss the mirrored pink disco ceiling. We have made an agreement to move our offices, but as of this writing, things are moving slowly. Some modifications need to be made to the building, so when the construction dust is flying, we’ll let you know what our new Plaza address will be. Oh, speaking of driving…I’ve noticed that the border area, when headed back to the U.S., now has a lot of vendors and people asking for donations and selling tortillas and other stuff. And some are getting a little aggressive and stepping into the roadway so please drive slowly and be careful. My truck is wide and I swear a couple times I was going to smack them with my mirrors. I usually travel on light traffic days so I can imagine what danger it is on the holiday weekends – or just weekends in general. Obey the speed limits and watch out for vendors and people. 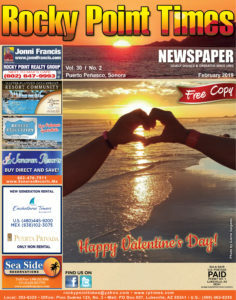 One last thought before Mario gets his chance haha…This is starting off to be a very exciting year for Puerto Peñasco and I expect it to just get better and better, so I must remind all of you to be sure you do your due diligence when purchasing property or making any private transactions in Mexico. We do have a real estate association (AMPI) and you can contact them with any questions you have about purchasing property in Rocky Point or you can give us a jingle and we will point you in the right direction. Ask questions, get answers and do your homework! We don’t want anyone to regret investing in our great city – there are big things on the horizon. We will begin with the weather…it has been cold, yes, you heard right, some days it was so cold our bones hurt. We had to make a quick trip to Mexicali and the car thermometer was saying we were at 37degrees F at around 5:30 am. We have no heater in the car (that’s another story) so it was pretty cold and once we got to El Golfo it was 30°. Some parts of the state had lots of snow, hail and freezing temperatures. The coldest places were Cananea, Nogales and Aguaprieta. Some highways had to be closed due to the black ice. Buses with passengers were stranded and there was nothing they could do. The Rumorosa on the Baja side also got snow! It was the first time in years I had to wear gloves and a beanie hat and a nice big warm jacket. We have seen on the news many farming areas lost their crops and we hear the cold weather will continue, so take care. I myself have had to take pills, injections and cough syrup for my cold and it hasn’t been working much. Not everything is bad or cold news…asparagus season is here so you will see people on the corner selling bundles and I recommend you get them while you can. They are cheaper than buying them in the states or at the market. Caborca is the biggest producer of asparagus in the region and the clean them and select only the best ones to ship. We do have a small area here in Puerto Peñasco where they have begun to grow asparagus – it’s out at Ejido Kennedy, on your way to Sonoyta. I would like to recommend a place to buy them which is right past Ley Express on Josefa – there is an older gentleman selling them out of his truck with a blue tarp on top. You can’t miss him. I received a letter from one of our readers that lives out at Estero Morua. He is concerned about all the trash on the side of the road (the Caborca Hwy). He and his community are trying to keep the area and the beaches clean, but it’s been hard to keep up with and he’s asked us to reach out to the city on their behalf. Estero Morua is the area around Playa Encanto, Miramar and up to the Mayan Palace. Everyone who drives that highway has known this has been a problem for years, and even though the trash has been picked up a few times, people are still dumping along the highway and it’s just not fair. We will contact the city once more and see if they can clean up the area and maybe come up with an idea to keep the area clean. I can say I feel ashamed for the people doing this. Its’ not right. Our city should be clean and kept clean by everyone that lives in it. Another letter I received is something that gets you thinking, how the heck did that happen? So here is the story…our friend, Fred, from Oklahoma was out visiting Playa Encanto when he found a wallet on the beach: Inside the wallet, among other things, was a driver’s license and 4 credit cards. After going back home to the U.S. he contacted the owner of the wallet through his AAA card that was also inside the wallet. And here is the weird part…the owner lost the wallet in Mazatlan!! Yep, you heard that right…Mazatlan, Sinaloa, a whole other state south of us about 800 miles! The owner of the wallet says he lost it on the beach a day that he went swimming. So somehow the wallet travelled or “swam” the Sea of Cortez and made it to Playa Encanto. It’s just amazing. My first thought was an animal must have eaten it whole and then threw it up or came out the other way lol. I told my Dad about this and he thinks the current and the waves and the wind just brought it all the way here. I would like to know what you all think and if you have a cool story such as this one, you are welcome to send me a letter or an email and I will talk about it in the next editorial. 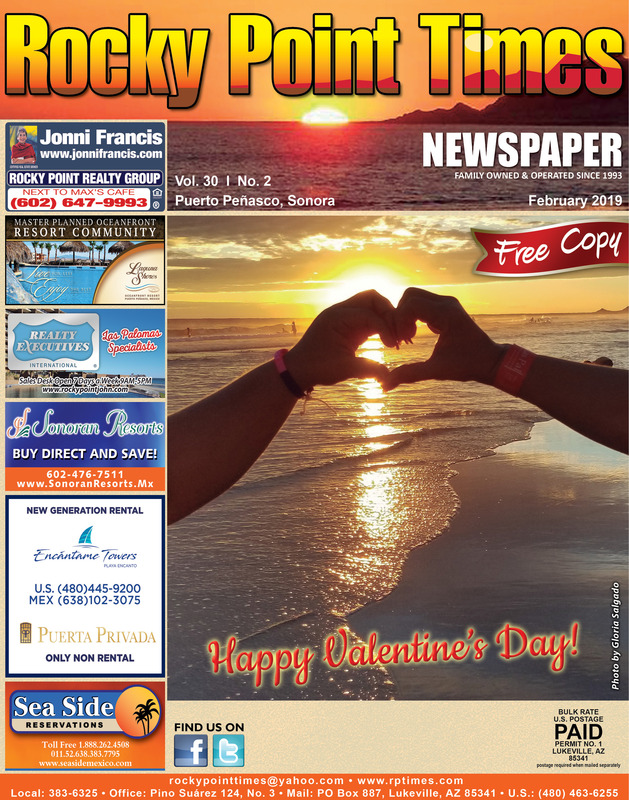 On a last note, just want to let everyone know that the Rocky Point Times is a tourist newspaper and we don’t write about, or get the paper involved in, politics, religion, or violence issues, not just from Rocky Point, but from anywhere in the world. The only exception to that is if there are issues that affect the safety and well-being of our visitors and residents. Someone asked me why we don’t print issues about the local police? And we have certainly have many times in the past. We pass all of your concerns and issues along to the proper departments and I urge all of you if you have a problem with the police or Mayor or whomever, you reach out to them directly and to the Mayor and/or City Hall. And there are also many forums online as well. We are here to promote the city, provide interesting content for tourists and residents as well as useful information. We like to be positive and bring everyone good news, there is already tons of bad news around the world and lots of media to cover and report about them. We like to write about positive things about our little paradise town. And lastly…Thank you for all your letters and support!